The Auto-Organize feature is for moving stuff from an "incoming" folder (outside of your library) into your library. 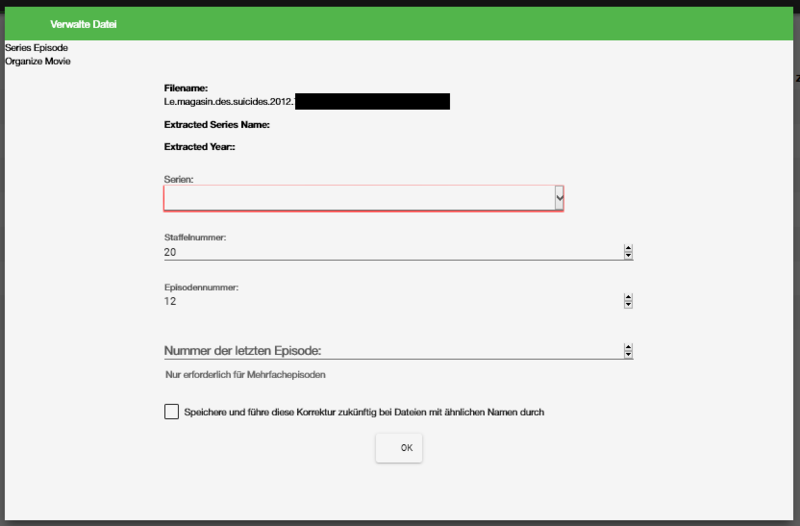 For episodes, the files are renamed to the defined scheme on the configuration page. My plugin adds a manual organize feature for movies. In this case the file itself is not renamed, but it is put (copied or moved) into a new folder of the scheme "Moviename (Year)" which is the recommended naming for Emby. what happens with subtitle files and folders? Are they being ignored? Edited by horstepipe, 14 June 2016 - 07:18 PM. At this time these are ignored. Good to hear that - thanks for reporting! can you tell me where should I put this dll? I mean into which directory of emby? I'll then try to make it work with my Linux build and let you know my results. Unfortunately recent changes to the core server broke our plugin again. is this only for testing with beta / dev sever versions? is there a version working with current stable? One of the previous versions probably will work with the release version, but when the new changes are coming in, with the next release version, it will be broken again. That's why MovieOrganizer itself is still "Beta" and not yet in the Plugin catalog. In a few weeks all those changes that are breaking the plugin will be finished. Your plugin works quite good on Linux with version 3.0.6060.0 (current stable). Why don't you simple move the whole folder instead of the movie file only? Probably, a library scan will precede one's manual organizing of unrecognized movies and series which means their folders will be filled up with subtitles, cover arts, intros, etc which would be also useful in their final place.